Q: Where is Red Beam Garage C located? A: Red Beam Garage C is conveniently located at 1960 Post Road in Warwick only steps from T. F. Green Airport. A: Our Rhode Island Airport parking facility is a 24-hour operation. We are always open. Q: What is the best way to get to the garage? A: We have two different points of entry for our garage. You can enter the garage from our Post Road entrance or you can enter the airport property from Airport Connector Road and follow the signs for “Arrivals”. Dropping off guests? At the light, take a right to go through the arrivals tunnel. The members of your group can walk right into the center of the terminal. After dropping off, continue straight around the circle and Red Beam Garage C will be on your right. Q: How can I find my way back to the garage? A: You will walk back to the garage the same way you got to the terminal. Follow the wayfinding signs for Garages A and B. You will walk through Garages A and B. The Red Beam Garage C will immediately follow Garage B. See graphic above. Q: Does Red Beam provide shuttle transportation? A: No, Red Beam does not provide shuttle transportation because the garage is adjacent to the airport. We are just a short, 3-minute, covered walk to the terminal. Q: What is the clearance height for the garage? A: Our clearance height to enter garage is 8’4 and 7’0 going up levels. The 1st floor will have spaces for oversized vehicles, feel free to email redbeamgarage@propark.com if the clearance of your vehicle is over 8’4. Q: Do you have a Customer Service Center to help answer my questions? A: For fastest responses please email us your questions questions or fill out our contact form. If you have a question that is high priority, please feel free to call our Rhode Island Airport parking office at 401-250-8001. Q: What should I bring to the facility on the day of my departure? A: If you have a reservation, please be sure to have printed the reservation voucher that was emailed to you as a PDF attachment. You can also present the barcode on your mobile device or via the Red Beam Garage mobile app. If you do not have a reservation, feel free to enter the garage and pull a ticket from the machine. Keep the ticket safe and when you return from your trip you will be charged for the duration of your stay. You need this ticket in order to exit the facility. Q: Does Red Beam Garage C accept motorcycle parking? A: Of course, we welcome all guests of T.F. Green Airport! Q: What should I expect when I arrive at the facility? A: Our state-of-the-art parking equipment is capable of scanning your barcoded prepaid reservation, mobile app for the Park for Peanuts Loyalty Program members or you may pull a ticket from the machine to gain entry. Once you enter our Rhode Island Airport parking location, please proceed to the open parking space. Q: What should I expect when I return? A: Once you pick up your luggage, exit baggage claim and make a right. You will walk through Garages A and B to get to the Red Beam Garage C. The first Garage you will see is A on your right. Follow the Pedestrian Walkway through A and B to Garage C lobby. Q: How do I exit? A: Our technology makes it easy to scan your voucher, pay and exit the facility without exiting your vehicle. If you are a part of our Park for Peanuts loyalty program, members can scan their loyalty account barcode from their mobile app to earn points, redeem reservations and pay for parking. Should you require any assistance, please stop by the parking office, located on the ground floor next to the lobby. 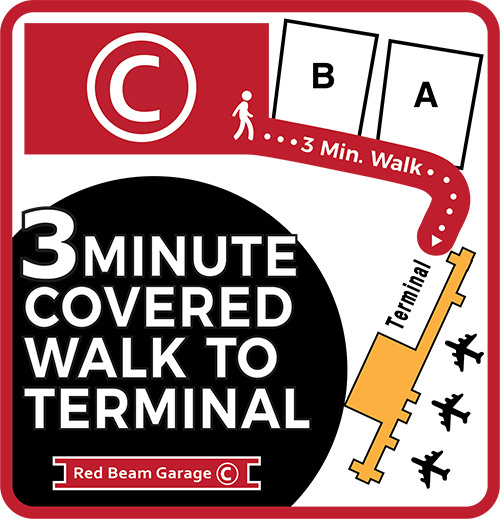 Q: How much earlier should I arrive at Red Beam Garage C prior to my flight? A: Please contact your airline or airport for approximate arrival time. When you have this information we recommend adding another 15-20 minutes to allow you to enter the garage, find your space, grab your luggage and walk to the terminal. Q: Are the parking rates based on 24-hour days? A: Yes. The parking rates are structured to start when you pull a ticket or when a reservation barcode or loyalty barcode is scanned. Your time is calculated from the beginning of your check-in to the time of your exit, not by the calendar date. You will be charged for the exact time in the garage. If there is any extended stay past a reservation you will be charged for the additional time upon exiting the garage. Q: Do I have to book a reservation before arriving at the garage? A: No, you do not. We welcome everyone and will provide you a ticket upon entrance. However, making a reservation does guarantee a space within the garage. If we are at capacity, only travelers with a reservation are guaranteed a space. We also cannot guarantee specific spaces to customers. They are first come, first served. This includes handicap spaces and covered spaces. If you’d like to make a reservation before entering the garage, please visit our reservation page or book on the mobile app. We cannot take reservations over the phone. Q: Do you have a weekly parking rate? A: Yes. Please visit our Weekly Parking Specials page. Q: Do you have a monthly parking rate? A: We do not have a monthly parking rate at this time. Q: Is the price different if you do not make a reservation ahead of time and just pull into the garage? A: No, the price is the same for reservations made ahead of time or customers that choose to just drive into the lot. Q: Are there any other charges outside of your low daily rate? A: Red Beam’s low rates do not include applicable taxes and fees. Q: What are my Red Beam Garage C Airport Parking payment options? A: Red Beam Garage C is a credit card only facility. Payments can be made with debit cards and credit cards. Cash not accepted. Q: What if I don’t have a printer? Do I still have to print my PVD Airport parking reservation before arriving at the garage? A: No, you can show us the reservation on your phone or any mobile device as well! Q: What is your policy for canceling reservations? A: We do ask for 24-hour notice, however; if your travel plans change and you do not park in the garage, we can absolutely refund you for the full amount. If your dates of travel change you can still use your same reservation voucher, our PVD Airport parking system will automatically adjust the parking days for you. Q: What is your policy for modifying reservations? Q: What if I need to extend my current reservation? A: If you need to park in the garage longer than your reservation, you are more than welcome. Unfortunately, we cannot accept multiple reservations so you’ll just have to pay the additional amount upon exiting the garage. Q: Previously, after taking long trips, we have needed our vehicle jump started in order to get car started again. Do you have jumper cables? A: Red Beam to the Rescue! We do have a jump starter kit on-site and are happy to provide this for your use upon return from your trip. Q: How do I earn Parking for Peanuts rewards points? A: You earn one point for every day you park with Red Beam. For a limited time, enroll today and get a FREE DAY of parking right away! Q: How do I redeem my free day? A: You need to be sure that you are logged in to your Park for Peanuts Rewards Account prior to requesting a quote for the reservation. Once the quote appears a drop-down menu will show to redeem your free day. This will adjust the price and you can then move forward with payment. We do not automatically include the free day as some guests prefer to save them for a longer stay. Q: How many points does it take for a free day? A: 7 points are required per free day. Q: I’m a Parking for Peanuts rewards member, but I didn’t receive a receipt at the facility when I paid. What happened? A: Red Beam Garage C is committed to sustainability in Rhode Island Airport parking. As such, we’ve designed our rewards program to be paperless in nature. As long as you have checked that you would like to receive emailed receipts on your account, then you will receive an electronic receipt within 48 hours of check out. If you have any issues feel free to email us and we would be happy to email you a copy of your receipt. Q: How do I use a Red Beam Garage C coupon? A: You must bring the coupon with you to the facility. Upon exit, insert your ticket first and then scan the coupon. If you are using the coupon for an online reservation, type in the barcode/promo code in to the promo code field. Q: Is Red Beam Garage C responsible if valuables go missing from my car while it’s parked at your facility? A: While Red Beam Garage C is staffed 24 hours a day, as a self-park facility, we cannot be responsible for belongings left in your car. As with all parking situations, if you want to guarantee the security of your items, please do not leave them in your car. Q: What if find damage on my vehicle that occurred while it was parked at your facility? Whose insurance will cover the damage? A: If you find damage on your vehicle that you feel occurred while parked at our facility, report it to an employee prior to leaving the property. You will be provided with a customer claim form to complete, a detailed investigation will be performed, and you will be contacted by our corporate insurance claims department. If you do not report the damage before leaving the property, we are not liable for the damage. Please use the entrance on T.F. Green Airport Connector Road.